Mrs McOnie’s Speech and Drama students received outstanding results in the International Trinity Awards for Speech & Drama. 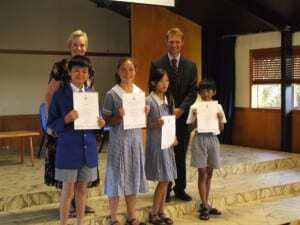 These awards are judged to a very high standard and Mrs McOnie and Mr Crompton were proud to award four students with their certificates at Assembly on Friday 21 February 2014. Three students received Merit and Vishwas Lyer received the very coveted award of Distinction. Congratulations to all on an excellent achievement.